If England somehow manage to reach the final of the Women's World Cup, they will owe a huge debt of gratitude to Anya Shrubsole. Forced to sit out the shock opening defeat by Sri Lanka, the Somerset seamer has since taken 13 wickets in four matches, more than any other bowler in the tournament. Match-winning spells against West Indies and South Africa came either side of a high-quality opening burst against Australia, a match in which Shrubsole did not deserve to finish on the losing side. With an action similar to South African paceman Andre Nel, the right-armer has a knack of homing in on the right-handers' stumps with late in-swing. The yorker that bowled Jess Cameron in a spell of 3-24 against the Aussies was unplayable, while four of her victims in a career-best 5-17 against South Africa were either lbw or bowled. 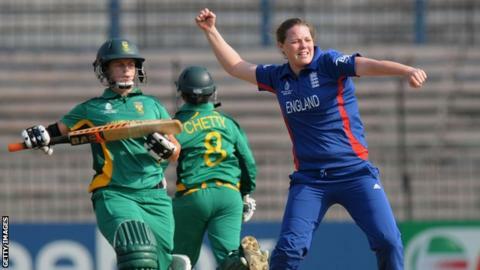 "I've started swinging the ball in a bit more than I have before," Shrubsole told BBC Sport. "It's just about consistently bowling in the right areas, which I've managed to do in the past few games. When you do that, you give yourself the best opportunity to take wickets. "I'm just looking to bowl as straight as I possibly can to give myself the best chance to take wickets. You only get that from attacking the stumps and I try to do that as much as possible." The likeable 21-year-old from Bath is adept at dealing with the media and always happy to stop and chat once the cameras and microphones have been put away. Confident and articulate, Shrubsole is described as the "intellect" of the England squad by batter Lydia Greenway. While it has been her bowling that has being earning the plaudits in India, perhaps the most revealing insight into Shrubsole's self-belief was her performance with the bat in the two-run defeat by Australia in Mumbai. Striding to the crease at number 11 with 34 needed, Shrubsole ignored the fact she had not batted in a one-day international since November 2010 to launch a counter-attack that offered England the prospect of an unlikely victory. Her dance and strike over mid-on from the off-spin of Lisa Sthalehkar demonstrated the quality of a batter who regularly lines up at number three or four for Somerset. In the end, it was cruel that Shrubsole had to stand at the other end as Holly Colvin was caught behind to give the Aussies a win that pushed England to the brink of elimination. Her response was to destroy South Africa. "I'm really happy with the way the ball is coming out for me," added Shrubsole, who is reaping the rewards of work done with Warwickshire bowling coach Graeme Welch. "When you're bowling like this, you just want to bowl whenever you can. Confidence is high." Shrubsole, however, has been through some dark times on the way to forming a dangerous new-ball partnership with Katherine Brunt. Since taking 1-26 on debut at the age of 16 in 2008, Shrubsole has managed to play only 14 ODIs for England because of a horrendous run of injuries. That year she was named as the most promising young women's player in the country by the Cricket Society and played one match as England won the World Cup in Australia in 2009, only to be ruled out of the World Twenty20 three months later by a back injury. She missed part of the following summer with a hip problem, was unable to travel to Australia in early 2011 because of a thigh strain and had her English summer of that year ruined by ruptured cruciate knee ligament. Returning to the international fold after a two-year break in early 2012, Shrubsole played in all of England's matches at the World Twenty20, taking three wickets in a campaign that ended in a final defeat by Australia. Now, in better physical shape than earlier in her career, she is grasping a long-awaited opportunity to make an impact on the world stage. "My injury problems are well documented," said Shrubsole. "But it's all about putting in the hard work and I was in a really good place coming to this tournament off the back of the World Twenty20. "I'm just happy to be out here on the pitch, performing well enough to contribute to England's successes." Modest words, so it was left to Greenway to extol the virtues of her team-mate. "She's obviously bowling brilliantly. She and Katherine Brunt have been leading our attack magnificently," said the Kent left-hander. "Annie's been moving the ball left, right and centre. It's quite pleasing to see how she's been bowling and the amount of wickets she's been picking up." Edwards goes further, saying Shrubsole has "come of age" in India. And, with England coach Mark Lane believing she can still improve "another 20%", plenty more can be expected from Shrubsole in this Ashes year and beyond. For now, though, her primary objective is to reach the World Cup final. No England player deserves it more.